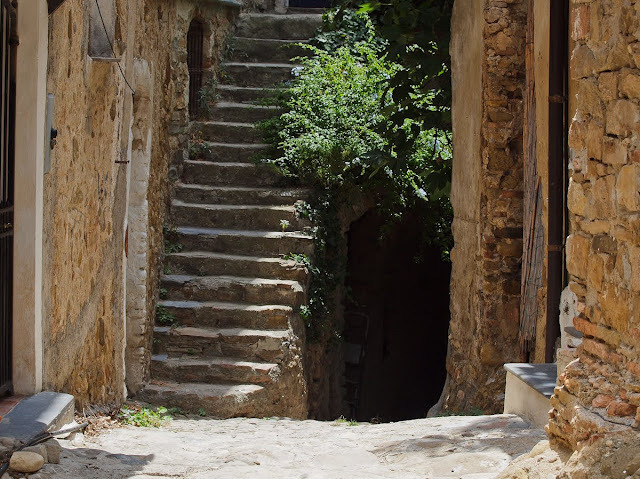 A narrow alleyway disappears into the shadows hiding an even narrower passage. Happily - there are no Health and Safety regulations in Bussana Vecchia. Thank goodness. Une ruelle étroite disparaît dans l'ombre cachant un passage encore plus étroit. Heureusement, il n'existe pas de règlements d'urbanisme, d'hygiène et de sécurité à Bussana Vecchia . Dieu merci ! This looks like the juncture that many of us will encounter as we leave this life. did you step into those shadows and follow the hidden passageway? I don't think that I'd attempt those stairs as tempting as it is! Kate, those steps would lead to where someone lives. This is why all the old people who live in hill villages are so fit! Intriguing, that dark, narrow passage, but I'm not sure I'd follow it. In the USA there would have to be railing on the steps or the risk of a lawsuit from a fall would be too great. So many interesting things to imagine in this scene, the stairs alone, pretty steep, just think going up and down there every day, what a fabulous derriere you would have haha! I really want to stroll in those streets.